The Actinia equina specimen represents just one of the Museum’s collection of anatomically accurate invertebrate reproductions created in the late 1800s by renowned Czech jewellers Leopold (1822-1895) and Rudolph (1857-1939) Blaschka. The preservation issues surrounding soft bodied marine, bright coloured invertebrates like Actinia equina mean glass models are preferred in zoological teaching collections. Blaschkas’ techniques included using a lamp to soften the glass, then forming and pulling at the substance. This was a highly specialised method which vanished with the Blaschkas on Rudolph’s decease (Parker N.D.). Actinia equina attaches itself to exposed and sheltered hard substrata such as rocks. These creatures are commonly found along the UK’s coast, as well as the Mediterranean and even South African coastlines. While often depicted with tentacles adrift in the sea, you may be surprised to know these feisty anemones survive well in intertidal zones and can endure the desiccation and high temperatures (MarLIN, N.D.) associated with being exposed at low tide. While the jellyfish has a prominent coastal presence, anemone are generally not properly understood. The main moment of glory for Actinia equina is its hosting of Nemo’s Clownfish family in Finding Nemo! Cue cute Disney-Pixar clip. The specimen is distinctive in its appearance as a smooth column and up to 5 cm diameter base, meaning these animals are often wider than they are tall. 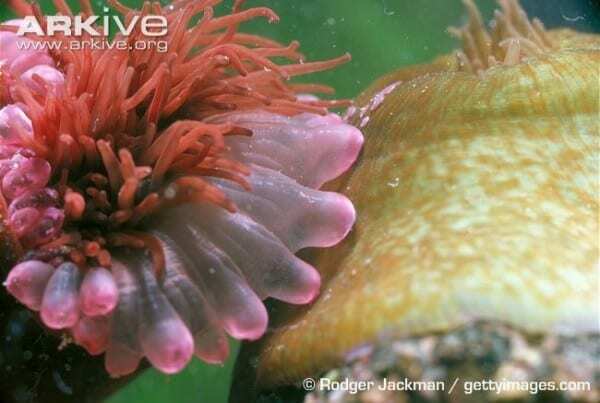 Beadlet anemones have up to 192 tentacles organised as six circles which quickly retract if disturbed. If they are immersed in the sea they gentle wave, yet once out of the water they are withdrawn to appear as a jelly-like pillar. Actinia equina have a solid colour, either of red, brown, orange or green, and acrorhagi, blue wart-like spots, adorn the anemone’s column (Devon Wildlife Trust, N.D.). Actinia equina are solitary species, and thus are particularly hostile towards neighbouring anemones. The animal reacts to the touch of anemone tentacles by stinging the victim with specialised cells known as nematocysts so it crawls or drops off the substratum. These sensitive tentacles are not only useful for attacking competing anemones, they also capture and poison passing prey which are lured in by their gentle movement. Ideal prey for Actinia equina are small fish, plankton, crustaceans and larger molluscs. 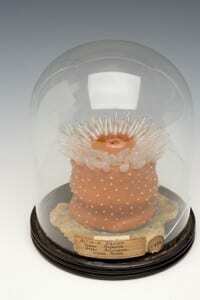 Although their reproductive methods are not fully understood it is thought that an asexual budding process takes place. Female and male Actinia equina develop young within their digestive cavity and then orally eject their offspring into the sea, ensuring the creatures immediately secure themselves onto substrate. Despite being depicted in the Grant Museum’s Blaschka collection as tranquil and beautiful specimens, these anemones are gutsy, independent and definitely solitary! Rachel Bray is currently studying an MA in Cultural Heritage Studies at the UCL Institute of Archaeology and is on a 20 day placement at the Grant Museum. Thanks for the blog link Roger – very interesting! Glad you liked the post Miranda!